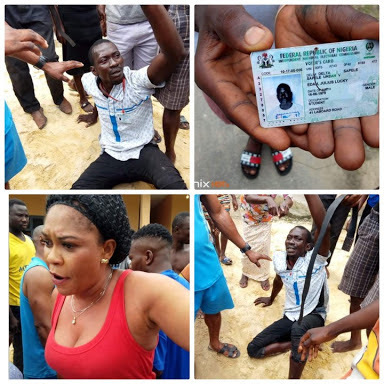 A man identified as Julius was almost beaten to death by a mob after he was caught trying to have s*x with the lady he went to rob, right in her home in Delta state. According to reports, the lady who was on drugs left her door open and slept off when the thief entered her room to steal her phone. The lady narrated that in her sleep, she felt that someone was caressing her, she woke up, saw the man on her and she started shouting thief!!! It was learnt that as the thief ran out of her room and was about to escape through Azigbo lane, he was caught by a mob who ran after him. It was gathered that the lady (who wore red singlet above) was sick and slept off after taking drugs that were prescribed for her by a doctor. Some people on Facebook who claim to know the said thief are saying he is mentally unstable, but the claim is yet to be verified.